An all too regular and deadly occurrence for Beijing locals. 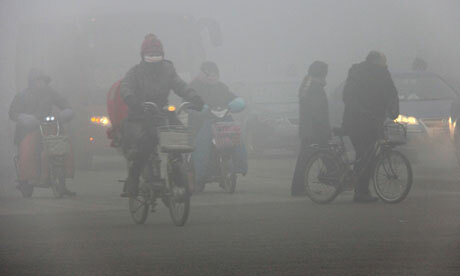 China’s urban air pollution is serious, lethal and chronic. It is a direct consequence of excessive dependent use of coal-fired power by industry, exponential growth in petrol/diesel vehicle use. In the capital Beijing’s case, Beijing’s geographic location at the northern tip of the North China Plain bounded by the Xishan and Yanshan mountain ranges, places it in natural valley head air trap. 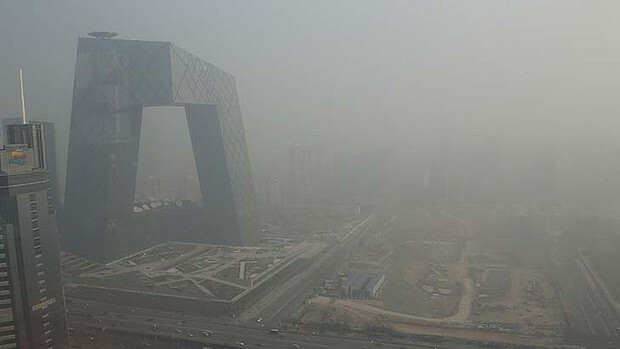 Under frequent meterological conditions, ambient air around Beijing has nowhere to go, and so lingers and becomes trapped for many days at a time. But introduce massive industrial and transport pollution with this natural and known lack of breeze, unable to fan away and dissipate local carbon monoxide pollution somewhere else, and so Beijing’s air becomes suffocatingly deadly smog. So Beijing is not a place tolerant of industrialised pollution. Beijing does not have to aspire to 1980s Los Angeles smog infamy, yet blind industrialism has slowly fueled a degradation of this ancient cultural city into a replica Los Angeles with all the ugly economic waste negativity. In the past three days, this is just what has again besetted Beijing – trapped ambient air pumped with massive local Beijing industry and transport carbon monoxide, has grabbing again world attention and empathetic concern for Beijing locals trying to breathe. As part of an emergency response to ease seriously dangerous air pollution the government of China has ordered government vehicles off Beijing roads. <<Beijing hospitals have been inundated with patients complaining of heart and respiratory ailments and the website of the capital’s environmental monitoring centre crashed. Hyundai Motor’s venture in Beijing suspended production for a day to help ease the pollution, the official Xinhua news agency reported. Measurements of PM2.5, fine airborne particulates that pose the severest health risks, rose as high as 993 micrograms per cubic metre in Beijing on January 12, compared with World Health Organisation guidelines of no more than 25. Long-term exposure to fine particulates raises the risk of cardiovascular and respiratory diseases as well as lung cancer, according to the World Health Organisation (^WHO). ”Pollution levels this high are extreme even for Beijing,” the Beijing head of ^Greenpeace East Asia climate and energy campaign, Li Yan, said. Exposure to PM2.5 helped cause a combined 8,572 premature deaths in Beijing, Shanghai, Guangzhou and Xi’an in 2012, and led to economic losses of $US1.08 billion ($1.02 billion), according to estimates in a study by Greenpeace and Peking University’s school of public health published on December 18. ”The number of people coming into our emergency room suffering heart attacks has roughly doubled since Friday when the air pollution became really severe,” the deputy head of cardiology at Peking University People’s Hospital, Ding Rongjing, said. China, which the ^World Bank estimates has 16 of the world’s 20 most-polluted cities, is the largest emitter of greenhouse gases. On Sunday, Beijing began its emergency-response plan to the pollution, which included ordering government vehicles off the roads to cut usage by 30%, according to Xinhua, citing the director of the city’s environmental protection bureau’s air quality department, Yu Jianhua. The plan also calls for construction sites to limit activity that creates large amounts of dust and asks industrial companies to reduce emissions. [Ed: Problem is that Australia’s coal exports, while driving China’s prized economic boom, at the same time are poisoning urbanised Chinese with coal-fired carbon monoxide. <<..Outlines the existing policies already underway to address climate change and cut carbon pollution and introduces several critical new initiatives. <<The Australian Government has been advised by scientists that the world’s climate is changing and that there will be adverse effects on our nation if the trend of rising temperatures continues. As a hot and dry continent, Australia has more to lose from climate change than all other developed countries. There are significant risks to our environment and our economy. The clear scientific consensus is that human activity which releases carbon pollution into the atmosphere, mainly the use of fossil fuels, is risking dangerous climate change. This is why the Government has adopted a plan for a clean energy future for Australia. The plan will cut pollution and drive investment helping to ensure Australia’s prosperity in the low pollution world of the future. We will do this by introducing a carbon price into Australia’s economy. This will put a price tag on every tonne of carbon pollution released into the atmosphere by the country’s biggest polluters – around 500 businesses will be required to pay for their pollution under the carbon pricing mechanism. The carbon price will create a financial incentive to reduce carbon pollution that will flow through our economy. Households will be looked after with tax cuts, higher family payments and increases in pensions and benefits, to meet the costs passed through by some businesses. The carbon price will change Australia’s electricity generation by encouraging investment in renewable energy like wind and solar power and the use of cleaner fuels like natural gas. Treasury modelling shows the economy will continue to grow strongly with a carbon price. Extensive analysis by economists and independent institutions such as the Productivity Commission has demonstrated that market mechanisms like a carbon price or an emissions trading system are the cheapest ways of reducing pollution. The Government is committed to supporting jobs as the economy is transformed. That is why we will support jobs throughout manufacturing, including in the steel and food processing industries, and in coal mining. Australia has boundless renewable energy resources. We need to do more to take advantage of these resources. The Government’s Renewable Energy Target, combined with the carbon price, will deliver around $20 billion of investment in renewable energy by 2020 in today’s dollars. It will mean that the equivalent of 20% of Australia’s electricity will come from renewable sources by 2020. The Government will also drive this shift by creating a $10 billion commercially oriented Clean Energy Finance Corporation to invest in renewable energy and innovative technologies to cut pollution. The world is moving and economies which do not start cleaning up now will fall behind. Australia has spent the last decade working out that putting a price on carbon pollution is the cheapest way to tackle climate change. 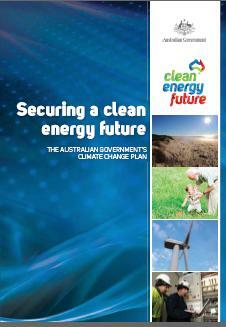 The Government’s plan for a clean energy future has been negotiated by the Multi-Party Climate Change Committee. The Committee has agreed to a comprehensive set of measures to help fight climate change. Meanwhile, Australia’s coal exports to China continue unabated – in 2011, 13.7 million tonnes of metallurgical coal. Australia provides around 30% of the world coal trade, which still accounts for 40% of total world power generation. In 2011, Australia was the world’s largest exporter of metallurgical coal and the second largest exporter of thermal coal. Australia is also the fourth largest producer, and has the fifth largest resources of black coal in the world. The majority of Australia’s metallurgical and thermal coal exports were exported to the Asian region in 2011. This leading position has grown over many years of coal trade, based on the quality of Australian coal resources and the ability of Australian industry to meet and respond to the needs of its customers. In 2011, Australia’s top four export markets for metallurgical coal were Japan (40.8 Mt), India (28.9 Mt), Republic of Korea (16.5 Mt) and China (13.7 Mt). Australia’s top four export markets for thermal coal were Japan (65.4 Mt), the Republic of Korea (29.5 Mt), China (19.9) and Taiwan (19.1 Mt). 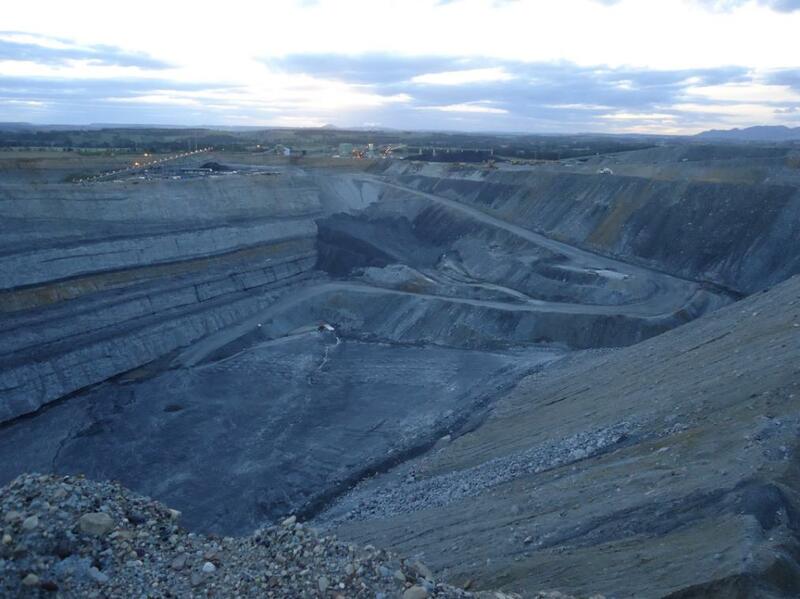 Australian brown coal (lignite) production, mainly from the Latrobe Valley in Victoria, was 68.75 Mt in 2009–10. Brown coal is used domestically in electricity production. Coal, both black and brown, accounted for over 75 per cent of Australian electricity generation in 2009–10..
Australia: committed to supporting jobs in coal mining, despite a domestic economy not allowed to fall behind, while climate change negotiations are for other government departments to distract the limelight. So the Australian Government’s plan for coal exports is to nearly double capacity from 2008 to 2017, while at the same time..
How is such a ‘plan’ not a right proper farce? Coal stocks await loading for export in Newcastle. Newcastle Port Corporation CEO Gary Webb says record coal export figures are due to all stakeholders working together on the Hunter’s coal chain network. 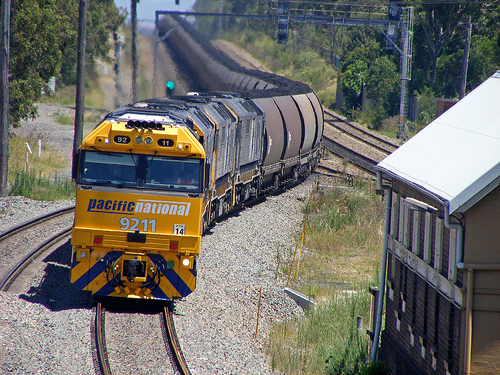 There were record figures for December while the total coal export figure for 2011 was just over 114 million tonnes – up 11 per cent on the previous year. The trade is worth nearly $13 billion. There were several extended maintenance outages on the coal chain network in 2011, but Mr Webb says they had no impact. 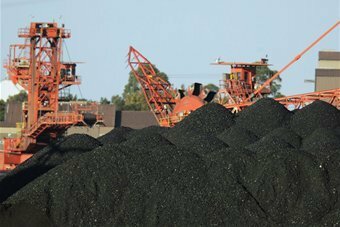 Newcastle Port Corporation says there is no doubt coal export records will continue to be broken, as new infrastructure comes on line. Planning is currently underway for Port Waratah Coal Services T4 loader, while mining magnate Nathan Tinkler also wants to build a loader. 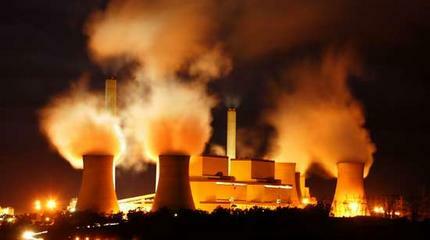 The Australian Government continues to encourage operation of Australia’s most polluting coal-fired power station. Worse is that corporate owner AGL pays no tax. <<More than a decade after first trying to get control of Loy Yang Power Station, AGL has won the prize and is paying just $400 million less than the $3.5 billion enterprise value of the original deal. Along the way, it has created competition policy history by challenging the Australian Competition & Consumer Commission in court. Yesterday, it finally forced the regulator to admit it had erred in its original rejection of the deal. Politically, its timing is perfect because it gets to collect $240.1m in cash to compensate for the cost of a carbon pricing scheme that Tony Abbott says he will scrap when he gets into government next year. The $1.1bn carbon permits AGL boss Michael Fraser will collect will be worthless, but then he won’t be paying any tax. The Loy Yang vehicle is virtually in the hands of its bankers now, which is one reason AGL wants to take full control before its 32 per cent equity stake turns into a millstone around Fraser’s neck. Joint venture partner, Japanese utility TEPCO, is under government control since last year’s nuclear accident in Japan. On balance, Fraser can say he has got a good deal, but against the history, this maybe not be quite as good as it first looks. Certainly, it is not as good a deal as his bankers got when you consider Citibank and Deutsche will collect $8.3m in underwriting fees on a deal with zero risk, being sold at a massive 22 per cent discount on a stock that, for its defensive qualities, will fly out the door. This must rank as the most expensive call centre in Australia. Citi picks up another $900,000 for advisory work and just how much the real star of the show, competition lawyers Ashurst, picks up was not disclosed. The ACCC had blocked the deal because it was worried Australia’s then biggest energy retailer, by controlling 30 per of Victorian coal, would set the scene for mass consolidation. Barriers to entry created by the vertical integration were, of course, not as the ACCC first imagined, as the Federal Court told the ACCC in 2003 and the market has shown ever since. The market is now dominated by three integrated suppliers — AGL, Origin and TRUenergy — with a plethora of smaller retail firms and generators headed by Tasmanian Hydro and Snowy Hydro. While final ACCC clearance was a walk in the park, Fraser has timed his run well, because the next consolidation will be looked at more seriously. This is saying something, when you realise this deal was the result of some five months of negotiation. Fraser says the deal works out cheaper than the NSW assets it missed out on 18 months ago and cements the company’s place in the Victorian and South Australian market. And he still has plenty of fire power to bid for the next round of NSW privatisations. 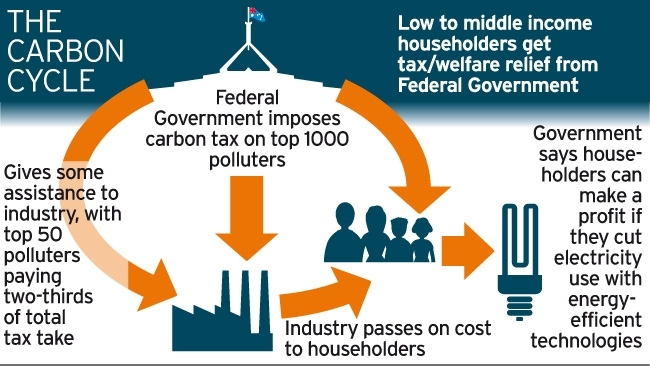 Just how the political windfall over the carbon pricing mechanism works remains to be seen. The Opposition Leader has said he will abolish it, but what will be left in its place is the key. Abbott could reduce the confusion by laying down the specifics of his plan. The carbon tax is, of course, another impost for already stretched consumers, but utility prices will be the main item to increases in price. On government estimates, a $50 shirt will cost 65c more when the scheme starts on July 1, and most shirts are imported, anyway. Myer has said its costs will rise by only $4.5m on a $1bn cost base. That explains why the retailers should be leading the charge telling consumers the impact won’t be as severe as some fear. Still, consumer sentiment is such that that will be a tough sell. as seen from the NASA earth observatory 20070111. 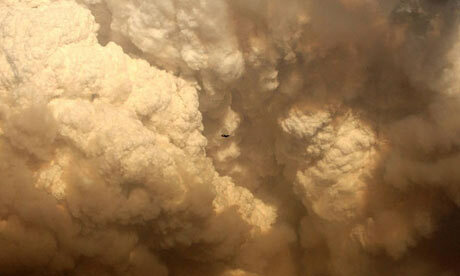 Grossly Under-resourced bushfire emergency management sees millions of tonnes of smoke polluting Australia. <<Victoria’s monster bushfires have generated the power of more than 100 atomic bombs and pumped out millions of tonnes of pollution, greenhouse gas and toxic clouds, scientists say. The tens of million of tonnes of carbon dioxide pumped into the atmosphere by the 1 million ha blaze exceed the combined emissions of the state’s power stations, industry and cars by about 30 percent, according to figures compiled for the Herald Sun online by the CSIRO. Victoria produced about 7.6 million tonnes of carbon dioxide in the past month from burning coal, petrol and gas; while bushfires raging in the same time pumped out 10.3 million tonnes of carbon dioxide. CSIRO atmospheric scientist Mick Meyer said the emissions from Victorian fires were about 10 times normal. The fires also generated 2.5 million tonnes of carbon monoxide; 300,000 tonnes of volatile organic compounds such as (Ed: acetaldehyde), benzene, formaldehyde and hydrocarbons; 85,000 tonnes of methane; 64,000 tonnes of nitrogen oxides; and 59,000 tonnes of smoke, Dr Meyer’s calculations show. ..The (Ed: carbon monoxide), methane and nitrogen oxide emissions would add to global warming with the heat-absorbing gases creating an effect equal to 2.6 million tonnes of carbon dioxide. “The emissions from bushfires including savannah fires, wildfires and fuel reduction burns account for about 3 to 4 % of Australia’s total greenhouse gas emissions,” Dr Meyer said. The energy produced by the blazes also dwarfs that produced by humans, according to data provided by the CSIRO and energy agencies. The fires have burned enough fuel to provide the entire state’s electricity needs for two-and-a-half years, or 125,000 Gigawatt hours, equal to the energy of 112 one-megaton atomic bombs. CSIRO Fire behaviour expert Justin Leonard said the emission estimates could also vary depending on whether the fires blazed through eucalypt or pine forests, grasslands or scrub, and the thickness of the fuel. A new study by the Melbourne University, the CSIRO and the national Bushfire Cooperative Research Centre has begun to better gauge the amount of pollutants produced by bushfires. Country Fire Authority spokesman Ken O’Brien said many people were unaware of the colossal power of an out-of-control bushfire. “You only have to see a reasonably small fire to realise the amount of energy produced,” Mr O’Brien said. Researchers say the most immediate pollution threat to Victorians came from tiny particles in smoke – with about 59,000 tonnes flung into the atmosphere by the fires. While comprising just 0.25% of the emissions, the Environment Protection Authority reported last month that the air quality over Melbourne was the worst since records began thirty years ago. 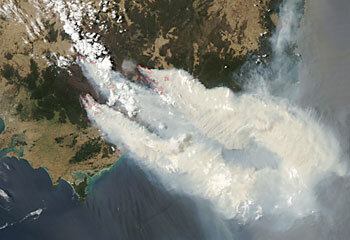 NASA satellites also clearly showed massive plumes of smoke spread as far as New Zealand and Tasmania. An EPA high smoke advisory for the Latrobe Valley and East Gippsland was still in place late this week as smoke levels there remained up to ten times normal levels. EPA spokesman John Williamson said the community could expect poor visibility and high levels of air particles from bushfire smoke. The state’s chief health officer Dr Robert Hall said excessive smoke could aggravate heart or lung conditions including asthma and also trigger respiratory problems in others. “It is likely that everyone within the community may be affected and they should avoid prolonged or heavy physical activity and stay indoors whenever possible,” he said. <<The deadly bushfires that have claimed hundreds of lives will also harm the environment as the carbon-rich eucalypt forests release their payload of CO2. Australia’s total emissions per year are around 330m tonnes of CO2. Adams’s previous research has shown that the bush fires in 2003 and 2006-07 had put up to 105 million tonnes of carbon dioxide into the atmosphere because they burned up land carrying 50 to 80 tonnes of carbon per hectare. This time, however, the forests being destroyed are even more carbon-rich, with more than 100 tonnes of above-ground carbon per hectare. The affected area is more than twice the size of London and takes in more than 20 towns north of Melbourne, so the CO2 emissions from this year’s disaster could be far larger than previous fires. The carbon dioxide emissions from forest fires are not counted under the agreements made by countries in the Kyoto Protocol, though it is being considered for inclusion in the successor treaty that will be debated later this year in Copenhagen. The usual reasoning behind it was that, with any fires, new growth of vegetation would take up any extra CO2 that had been released. “That is true to a point, but if the long-term fire regime changes – we are now starting to have more fires – we may completely change the carbon balance of the forest,” said Adam. 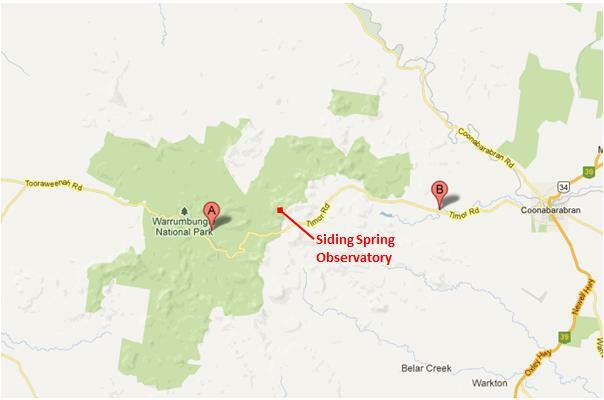 This one a few days ago shown raging towards Australia’s Siding Spring Observatory in the Warrumbungle Ranges. This latest bushfire episode has reported over 40,000 hectares of National Park burnt, which is how much CO2? <<The worst bushfires in NSW for more than a decade have ripped through the state’s north-west, taking 33 homes and destroying 40,000 hectares of land. <<About 100 people living in the area were forced to evacuate their homes and the RFS on Monday night said the blaze remained ”a large and dangerous bushfire” that was worse than the Black Christmas fires in 2001. On Monday night there were 125 bushfires burning in NSW, 30 of which were uncontained. The acting Premier, Andrew Stoner, described the bushfire season so far as ”a hell of a week” but while milder temperatures helped firefighters on Monday, winds and temperatures were expected to increase by Friday. The Bureau of Meteorology said most of the state would be in the high 20s to mid-30s with Sydney temperatures rising from 30 degrees on Wednesday to 37 on Friday. Bourke is forecast to be in the high 30s for most of the week, peaking at 40 degrees on Saturday. As Australia recovers from last week’s record-breaking temperatures, the head of the United Nations Intergovernmental Panel on Climate Change, Rajendra Pachauri, said it was clear heatwaves were occurring more frequently, and would increase further as the planet warms. ”It [last week’s heatwave] could be [a result of climate change], but I wouldn’t draw any conclusions on one single event,” Dr Pachauri said. ”I think you have to take the whole aggregation over a period of time and then come up with the conclusion, which is precisely what we have done. 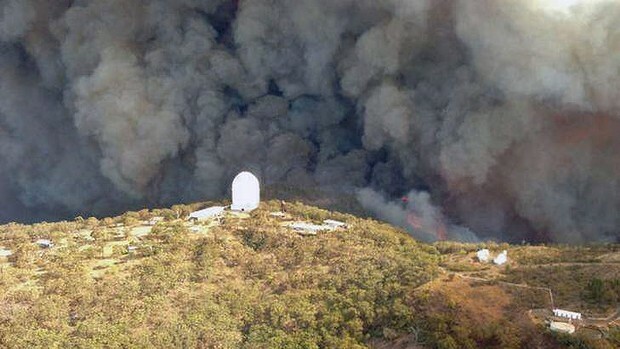 An RFS spokesman said the Warrumbungle National Park fire had been ”absolutely shocking”. 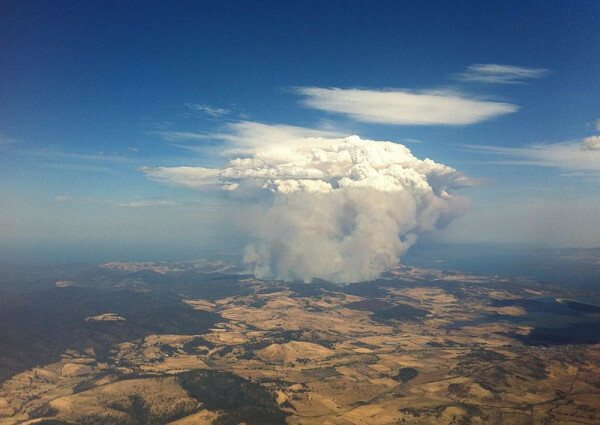 ”At one point there was a smoke plume rising 14 kilometres in the air. The fire was so big and there was so much smoke, it was shocking,” he said. ”It’s still not under control. It’s still burning in the Bugaldie area. It’s been a big effort to get around it. A teacher at Coonabarabran’s high school, Peter Morrissey, nearly lost the family home in the Yerrinan Valley. Firefighters were able to establish containment lines on a fire about 20 kilometres east of Cooma, in the state’s south. The fire burned through more than 12,000 hectares of bush and grassland. Ed: Australian uncontrolled Major Bushfires must be releasing more than 100 Hiroshima’s of Carbon Monoxide every year ~ yet culturally no-one raises a questioning eyelid of the slightest concern. DATE STAMP: Australian culture is at 2013. 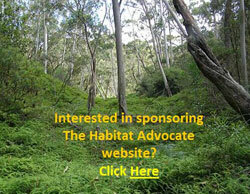 This entry was posted on Tuesday, January 15th, 2013	and is filed under Threats from Bushfire, Threats from Pollution.